We can give a big thanks to Babyology reader Sarah for bringing the Etsy treasure Francesca Baby to our attention. I love the funky fabric designs of the very talented duo Michael Miller and Alexander Henry. These designs, combined with the practicality of their handmade bibs and burp cloths is too much to resist. Francesca Baby offers bibs in the bandanna style – perfect for dribbly babes – as well as the traditional style. 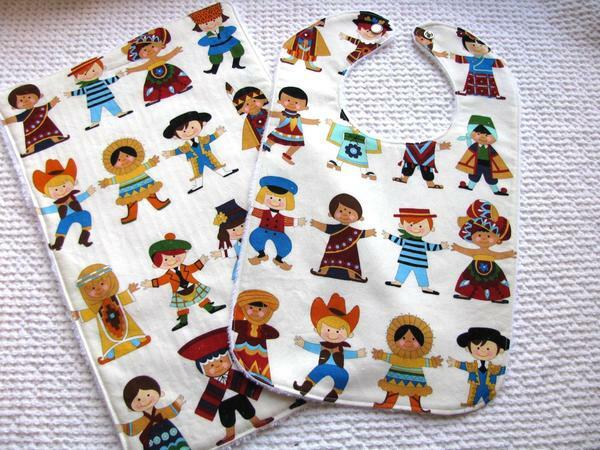 Bibs have a press stud closure so can’t be pulled off and are lined with plush and luxurious minky. Burp cloths are backed with absorbent chenille. This Owl On A Whim set is definitely my favourite; along with the Good Earth set (pictured above), I’m not sure if I could choose between the two! You can browse the virtual aisles of Francesca Baby at her Etsy store. Gift packs of both bib and burp cloth are available for a very reasonable US$15. Delivery to Australia is available.